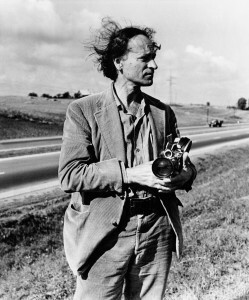 Jonas Mekas (1922–2019), tireless advocate for the underdog, was without a doubt the world’s foremost advocate for personal/underground/avant-garde cinema. As a poet, publisher, filmmaker, curator, critic, archivist, rabble rouser and hopeless romantic, his cultural influence cannot be underestimated. Born in Semeniskiai, Lithuania, Mekas emigrated to the U.S. in 1949 (after imprisonment in a Germen labor camp and life in a displaced persons camp), fell in love with New York City and immediately took to filmmaking, a practice he maintained to the end of his life, eventually pioneering the personal diary into an epic film genre. By 1955 he was co-publisher (with his brother Adolfas) of Film Culture, a journal articulating the aesthetics of underground cinema which was published quarterly until 1995, while his Village Voice column “Movie Journal”—which ran 1958–1978—presented weekly updates on the New York underground scene of the day while cultivating community and bracingly attacking mainstream cinema. A visionary infrastructuralist, Mekas’ establishment of the Film-Makers’ Cooperative (in 1962) and Anthology Film Archives (in 1970) ensured that underground and personal film would be preserved and cherished for generations. In this screening San Francisco Cinematheque and Canyon Cinema celebrate the life of Jonas Mekas with a special screening of his 1997 film BIRTH OF A NATION (1997): 160 portraits/appearances, sketches and glimpses of avant-garde, independent filmmakers and film activists, filmed 1955 – 1996, a celebration of Mekas’ artistic community and adopted homeland. Canyon Cinema’s co-presentation of this event is generously supported by the George Lucas Family Foundation, the Owsley Brown III Philanthropic Foundation, and Zellerbach Family Foundation’s Community Arts Program.